To my recollection this was Hood’s first ‘big time’ release, marking their shift from sporadic flurries of records coming out of tiny microlabels in bagged, hand-folded sleeves to a proper, ‘real’ label. (Bear in mind that in the spectrum of labels releasing Hood’s work, Domino were and remain independent yet Geffenesque in scale compared to earlier labels that they worked with). 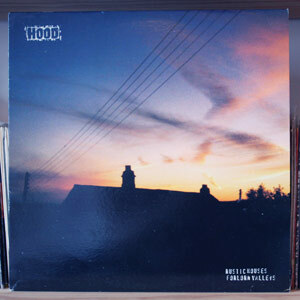 The Hood ‘aesthetic’ was all over this album – the record’s title creating some kind of Lakes village mystery, the grainy photographs of nothing that mask some unimagined tension and dread, and the insert contained within that, despite the run on this release being in the thousands rather than the hundreds, contained the band’s actual address as a means to contact. Since the early ’90s Spofforth Hill in Wetherby has seemed a mystical place to me, being the place from which both Hood and Boyracer – both long-term favourites of mine – originally appeared, and a road to which I sent countless letters back in the day when we all used to correspond through the mail. This Wetherby contingent – very recently celebrated on a new release from Boyracer founder Stewart Anderson’s 555 label – got involved with a lot of musicians and artists as time went by. Looking at the few names mentioned on the insert for this record we’ve got Matt Elliot (Flying Saucer Attack, Third Eye Foundation), Richard Formby (producer to everybody from Spacemen 3 to Telescopes to a billion other acts) and Nicola Hodgkinson (Empress) – just a tiny glimpse into a network of friends and collaborators that sprang up around Hood, Boyracer and their associated ilk. I was going to write about what a shame it is that Hood never became really big, and that they never seemed to break out of an in-the-know circle of people (admittedly, a pretty large circle) – they’re certainly good enough and have put in enough years of effort to warrant some kind of real recognition. But then again, maybe it’s not a shame? It’s always good to have a band or two who never ‘cross over’, who don’t become something they never hinted at becoming in their earlier days. Like the mysterious images on their record sleeves, Hood were then and still are a mysterious band, and one that you need to investigate and work with to get the most out of. 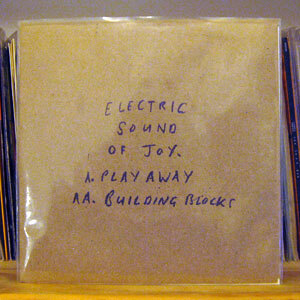 This record came in to my possession via the magic of eBay, seven or eight years back. Some kind soul in Brighton was selling a pile of around thirty underground/indie-pop seven inches in one lot, which I snapped up for some bargain price like £15 or something. Good times. It was super-exciting when a chunky parcel arrived some days later, as not only was there a whole load of new music to check out, but most of these records had nifty wraparound sleeves as well as all kinds of inserts tucked inside. Whilst eBay has destroyed a lot of the work that used to go into searching for and purchasing interesting and difficult-to-find records (is that a good or bad thing? ), I can’t deny that it’s still a bit of a buzz to secure a record on there and then wait for it to turn up in the mail. As an aside, I’m even playing all of these records on a stereo that I got from eBay! That was another fantastic, bargainous purchase – I get the impression that the seller was fleeing the county very quickly for some reason, but thought it best not to ask. Travelling to Woking to pick up the stereo was my first and only (so far) trip to that fair town. Have to say, it didn’t look up to much – and I didn’t see any obvious Paul Weller was born here tourist-bating stuff going on, either. Due to some kind of administrative mix-up, this record actually contains two copies of the same insert – a messy, square handwriting-and-photocopying job detailing the lyrics and including a few contact details and credits. I seem to remember that Harriet Records released a lot of good stuff, and must at some point check out the other of their releases that I’ve got. (Pop fact – Harriet was run by a genuine Harvard professor!) 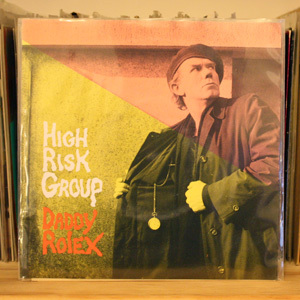 This record, with the only two High Risk Group songs I’ve heard, is moody and growling lo-fi indie soft rock with a few pleasing discordant bits here and there. Sounds like they may have been a pretty fine live band to me. Ah, Earworm – great label. They always seemed to be about the detail and the quality. Interesting bands and music, always packaged with an eye on keeping things fresh and worthy of a collector’s interest. This single, for example, has the simplest of covers, but it’s printed on pleasingly rough brown paper and contains an insert on the same stock, with typography that looks genuinely like it was constructed using old Letraset packs. (This matters in this modern age when a page of type can be instantaneously banged out by computer). There’s another insert in here as well where the exact contact details (at the time) of Earworm boss Dom, and Electric Sound Of Joy’s Paul can be found – actual home addresses along with telephone numbers. Do people still give away this amount of information about themselves these days, when everything can be immediately circulated and distributed across the world? Good times. Standing on the other side of me was where-is-he-now Irish comedian Sean Hughes. Crazy! I used to bleedin’ love Cud between the years of around 1990-1994. They were one of the first bands that saw me diligently buying every single release they put out, whilst constantly scouring record shops for their earlier work. Remember those days before eBay when it actually took some time and effort to build up a record collection? This 12″ is from their A&M days, after they’d bizarrely hit the big time – or, well, the small time, at least. ‘Bizarrely’ because they were always a bit of a weird outsider band, and just seemingly not normal enough to really make it, despite some superb songs and a brilliant (if deranged) frontman. Gone were their limited releases on Imaginary Records, distributed in hard-to-find places – these were their days of national press, big tours, and what seemed like endless marketing money to spend on freebies and gimmicks. This record, for example, comes with a free poster, which is a pretty straightforward trick – but other A&M Cud releases came with, off the top of my head, a set of commemorative stamps; a three-dimensional cardboard house; and some kind of cut-out-the-eyeholes face mask. Then, as so often happens when the industry steps in to ‘help,’ they were gone as quickly as they were famous. A friend of mine played a gig recently with the now-reformed Cud, and said it was a mix of nostalgia and pain – nostalgia at the obvious thrill of seeing a great old band playing some great old songs; pain at it being fifteen years later with no apparent forward movement from the band and, most awkwardly, the fans. The fans aren’t the young blades they once were any more; it’s all ‘a night off from the kids’ nowadays and an excuse to work on an already-expanded beer gut. (Not in my case of course; I don’t have kids).